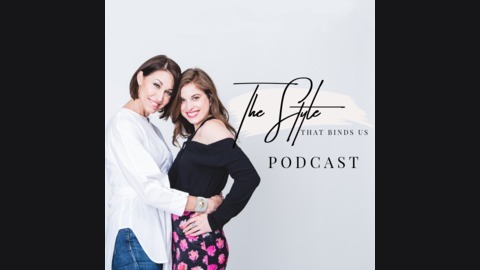 The Style That Binds Us Podcast features interviews with fashion & jewelry designers as well as entrepreneurs in the fashion, beauty, art and food industries. Learn how these trailblazers got where they are today and what their jobs are like. 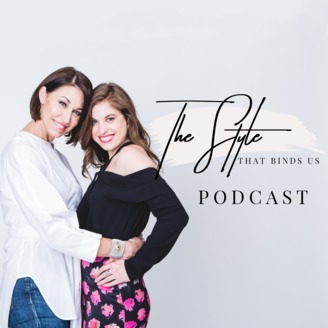 This podcast is brought to you by mother daughter duo, Alison Bruhn, an in-demand stylist, and Delia Folk, who works in the buying office at a world renowned luxury retailer. Delia will also provide insight as to how she got into the fashion industry, and what it’s like once you’re in it. Notes and links will be available on thestylethatbindsus.com. The episodes can also be found in video form on The Style That Binds Us YouTube channel. We hope to be your destination for all things style. We are coming together through our bond as women in the same industry, with the same passion, that happen to share the mother/daughter bond as well. We seek out the epitome of what is stylish and current in the worlds of art, fashion, design, music, dance, travel, food, women who inspire us, the list is endless...and the colliding of all these worlds. Enjoy and tell your friends, mothers, daughters, step daughters, sisters, cousins - everyone that they are invited to come along on our adventure; we are hoping each viewer or listener gains something in the process: style tips, new product information, a fabulous restaurant to try, how to wear a certain trend, for example, and has a few laughs along the way. Jean Prounis launched her fine jewelry line Prounis in 2017 when she was 24 years old. This line is filled with details from her family heritage of owning a cabaret club called The Versailles in NYC in the 1940s where Edith Piaf performed. We met Jean at The Frick Garden Party. Let’s talk about your family background and how you took all of that into consideration when creating Prounis. She always wanted to have an homage to her grandparents and she always loved jewelry. It felt like a great connection between the two. Her family is Greek and she has always loved ancient Greek jewelry. Her grandfather had an archive of books she frequently refers to. Her inspiration can come from pottery, architecture or jewelry. Talk to us about all the different elements from The Versailles that show up in your collection and brand. The sage green tablecloths that were used at The Versailles. The sage green is used in all of her branding. She recreated the matchbooks. They make stationary which is inspired by The Versailles menus since they were hand painted. What are some of your favorite stories your grandfather told you about Versailles? She remembers how proud he was of The Versailles. He left her a letter that wrote all the different performers with their names, dates they performed and lots of newspaper clippings. What does a typical day or week look like for you? Could get an order for a one-of-a-kind, sourcing stones, spend 2-3 hours at the bench making the pieces, finishes the pieces, lots of emails. Sometimes take time to volunteer. Cultural things, go to a museum, etc. What led to the decision of using 22k gold? It is the most historical alloy of gold. This is what you see at The Metropolitan Museum of Art. They won't oxidize or tarnish. They can get buried and in 2,000 years, it'll be intact. It is soft and the look is soft and buttery. She alloys all the gold in her studio in the jewelry district in NYC because particular about the gold coloring. She also uses recycled gold from a refiner and she alloys it again. Your skins oils polish the gold and it becomes a second skin. Where do you find the stones you use? Travel to Tucson. Lots of vendors in Manhattan. After you decided to start your jewelry brand, what steps did you take to make it happen? When graduated from college, she freelanced for a couple different designers. She was designing for family and friends. She liked creating one-of-a-kind pieces and accumulated pieces she wanted to create. How did you learn to make jewelry? Classes at FIT. Loved collecting vintage jewelry. She took a sculpture class in college and then took jewelry classes. Where do you get inspiration for your collections? Everywhere. Love going to The Met if in a pinch for inspiration. Look at her grandparents books. She loves going upstate New York, loves antiquing. How do you choose the price for your pieces? Price of gold & stones. The labor, packaging, time etc. Tell us about how you make a piece of your jewelry. There are a lot of one-of-a-kinds. Each link is handwoven & can take 2 months to make. They start by creating a long piece of wire, cut it open and there are links so consistent size, fuse each link and weave them together. Each end cap is made by hand. Did you grow up wanting to start a jewelry brand? Both of her parents were entrepreneurs. Her first company was called Java Chip Cafe in 4th grade. Her parents friends would come over and she would make them coffee. She went to FIT during middle school and took some classes. She started a t-shirt company with her friend. She loved the branding and creating stories. What advice do you have for someone interested in starting their own line? Think about how to brand yourself. Have a strong vision and stay true to it. People will tell you otherwise. Go with your gut feeling. Can't do it all yourself. You need help. What is it that you love about jewelry? She loves how it is personal and intimate. When she buys/makes jewelry, she is making it for everyday wear & durability. Make sure the stones won't break and that it will live beyond you. She loves how magical it is and how much meaning & memory can be stored in each piece. She has some of her grandmother's pieces, and when she wears them, she feels her grandmother is with her. How did you create your aesthetic? She creates jewelry she would want to wear. She likes to think of it as 3 categories: accessible pieces (Single earrings/studs), larger earrings & rings with mid-range pricing and bespoke/couture/one-of-a-kind pieces. How often do you create new pieces? Come out with one-of-a-kind pieces frequently. Quarterly releases of 5-10 chapters. How long does it take to go from concept to piece you can sell? Varies. Could be two days. Larger pieces can take a lot of time sourcing stones, materials, etc. What does the future of Prounis look like? Want to continue jewelry and going into home accessories - mirror, candlesticks, coasters, etc. She loves interiors, would love to be an interior decorator. She also loves candles and perfume. How did you learn to grow & start a business? Her parents are both entrepreneurs. Her dad was in data research and her mom was in marketing. She would ask them if she was struggling with anything. She studied business in school. It sounds like you have a close knit family through multiple generations, how has that shaped you as a woman? Sense of tradition and family values has transcended each generation. Honesty - going for good materials for the jewelry. Creative gene that has been passed along. Her dad loves music, her mom is a great writer. Vogue article - about history of the brand, Greek roots/heritage, East River meets The Mediterranean. She isn't trying to make glitzy jewelry, it is an authentic, everyday style. Prounis is sold at Dover Street Market, Holly Go Lightly, Catbird, Desert Vintage.